KITCHENER, Ontario, Jan. 19, 2017 /PRNewswire/ -- Coreworx announced that its interface management solution was selected and implemented on a $3.6 Billion dollar (US) petrochemical complex project in Oman. The five year project involves 4 major international EPCs from several geographic regions. "This project required a proven solution that could manage the large volume of project interfaces between the 4 primary EPCs as well as the numerous interfaces with regulatory agencies, local government offices, and suppliers/contractors. 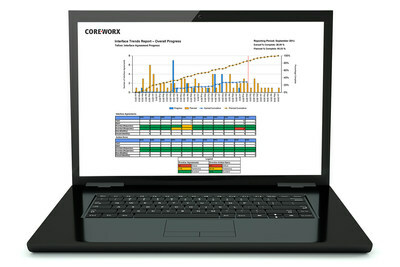 Designed for capital projects of all sizes, Coreworx Interface Management is successfully handling the interfaces on this project and offering stakeholders unparalleled transparency & decision-making through unique Coreworx owner oversight tools and dashboards," stated Ray Simonson, CEO of Coreworx. All capital engineering and construction projects involve complex interface dependencies between diverse contracting parties. These interfaces can create challenges to successful project execution. Coreworx Interface Management software helps project teams overcome these interface challenges through a pre-configured, web-based solution that supports the direct and formalized communication between contractors. Coreworx is a software and services company that builds integrated information management software & solutions for the world's engineering and construction projects. Used by companies like Fluor and Chevron, Coreworx software solutions service a portfolio of projects valued at over $950 billion across more than 40 countries, on more than 1000 projects with 100,000+ users. Coreworx software enables EPCs and owner-operators to automate best practices, mitigate business risk, and improve performance to budget throughout the entire project life cycle. Coreworx has sales and distribution locations in Houston, Calgary, Abu Dhabi, Doha, Kuwait, Seoul, Perth and Beijing.